That there, is my new computer. 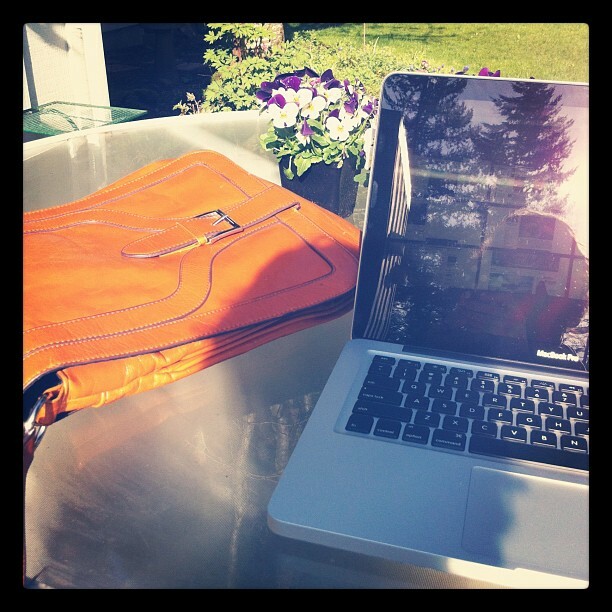 With me blogging in the sun. Yes, actual spring sun. Still a bit chilly, I’m wearing a scarf and hoody, but I’ve traded my boots for flip-flops at least for today. In all reality, I’m not sure what I’m more excited about, to be writing on a new, pretty, functional laptop, or to be writing on a new, pretty, functional laptop in the SUN. My relationship with my old and (used to be) trusty laptop that got me successfully through graduate school came to a rather abrupt end a few weeks back. I have long known that computers, well electronics in general, and water don’t mix. So, I’ve always been very careful whenever the two were in close proximity. While I was taking a bath and listening to A Prairie Home Companion (am I the only 25-year-old who loves this show?!) I was paying close attention to the computer to bathwater proximity, and sadly not so close attention to the glass of water to computer proximity. The precariously perched glass slipped and shattered, yes shattered, on my computer. Glass and water everywhere, a dripping laptop and me naked and sobbing. Long story short, I now have a new one. One whose screen I can see in the aforementioned sun! I tell you this story not so much as a warning, but more as an explanation for my long, long, LONG, absence. That, and I got a job. A job that I really enjoy. One that isn’t in my field of education, but is definitely where I am supposed to be. These two things have combined and conspired against me to keep me away from my computer. I hope, without too much further ado, and with great anticipation, I will return to writing and cooking. Hopefully in equal proportions. This entry was posted in Life, The View Through My Lens and tagged Life, Spring, The View Through My Lens. Bookmark the permalink.